However the most popular way of taking cannabis is smoking. Smoking cannabis gives a bigger high of people than eating. Cannabis cigarette are quite popular but it is cannabis pipes that are the mo9st popular. Marijuana pipes are very important marijuana smoking accessories. There are various kinds of marijuana pipes available in the market. While there are some cheap marijuana pipes, some pipes are very expensive as well. A marijuana pipe consists of a bowl, a shank .a stem and mouth piece. You place the marijuana in the bowl and it is burned there. The shank is nothing but the neck of the pipe .The stem connects the shank and the mouthpiece. You place the mouthpiece on your lips and smoke. These are basic things you should know before you go to buy a marijuana pipe. Even it is a cheap marijuana pipe make sure all its components parts are flawless. As marijuana pipes are important marijuana accessories there are many kinds of marijuana pipes available in the market. 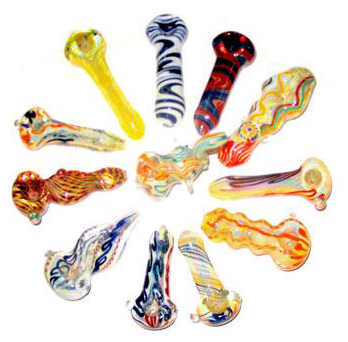 Some of these are glass pipes, wooden pipes and metal pipes. Glass pipes are the most common. They are considered to be better than wooden or metal pipes. These pipes do not get hot even when used for a long stretch of time. It is because of the quality of the glass used. However be careful while handling these pipes because they are quite fragile. Wooden pipes are also very popular. They are same as the one’s used by tobacco users. These pipes have a larger bowl than the glass pipes. So you can have a longer session of marijuana smoking. It also keeps the marijuana warm. The metal pipes are quite fascinating to look at. They are exquisitely designed in some cases and resemble antiques. A water metal pipe looks like a hookah. These pipes are quite popular as they give a very good high. Marijuana pipes come in different styles. There are bubbler pipes, chliium, foldable pipes and stealth pipes. Chillum are found in stone, metal and glass. Foldable pipes are made of wood and metal. One hitters give one hit and are pretty popular among people. There are also vaporizer pipes which look like normal marijuana pipes, but instead of burning the marijuana it vaporize the marijuana. Many people make their own pipes .You can also do this. All you need is a coke bottle, a little piece of piping say about 5- 10 cm long and a knife. First make a hole in the bottle and insert the pipe. Fix the socket to the end of the pipe that is outside the bottle. Make another hole near the first hole to act as your air hole. Then fill the bottle with water so that the pipe is in the water. Your marijuana pipe is ready! This entry was posted on Saturday, June 25th, 2011 at 21:56	and is filed under Marijuana Stuff. You can follow any comments to this entry through the RSS 2.0 feed. Responses are currently closed, but you can trackback from your own site.